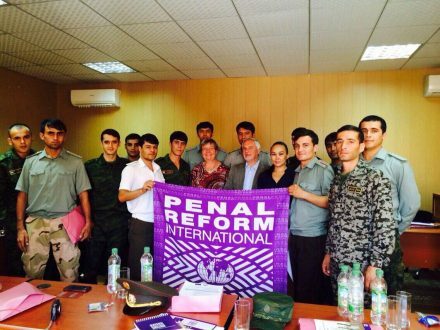 The training workshops, held on 25-26 August 2014 in Zhitikara, Kazakhstan and on 28-29 August 2014 in Tajikistan, were for prison guards and psychologists and aimed to evaluation of emotional condition of prison guards, promoting respect of prisoners` rights, prevention of violence. It was run by Penal Reform International in Central Asia, with financial support from the European Union. The trainings were focused on the discussion of difficult cases to communicate with prisoners, finding the most constructive communication strategies. Much attention has been paid to the problems of the emotional state of employees who work with persons serving life imprisonment or long prison terms. “A man who has committed a serious crime differs from those who are in critical situation. As a rule such people have personal characteristics that allowed them to break the law. Communication with them may cause difficulties for the prison guards and prison psychologists, lead to the development of their burnout syndrome “- said trainer Igor Dobryakov, expert of St. Petersburg Medical Academy of postgraduate education. Currently 120 people in Kazakhstan are serving a sentence of life imprisonment. According to the text of the new Criminal Code, which will enter into force on 1 January 2015, a person serving life sentence may be released on parole, if the court finds that it does not need further serving of punishment and actually has served not less than 25 years in prison. If the person who is serving life sentence, complied all the conditions of a procedural agreement, he may be released on parole after serving at least 15 years in prison. Currently at least 50 people are serving a sentence of life imprisonment. In legal practice of Tajikistan issue of rehabilitation is not applicable, as in accordance with the legislation parole does not apply to persons who are appointed for life imprisonment. The trainings are being carried out as part of Penal Reform International’s EU-funded, two-year global project on ‘Progressive abolition of the death penalty and the implementation of humane alternative sanctions after a moratorium or abolition’. The European Union has allocated EUR 161 370 for the implementation of this project in Central Asia.